The Jazz Eclectic Concert Series Vol.4 featuring very special guest, 2X GRAMMY WINNER, bassist, arranger, composer John Clayton. John has composed and arranged for such notable artists including Diana Krall, Quincy Jones, Natalie Cole, Paul McCartney, Whitney Houston, Nancy Wilson, the late Count Basie Orchestra and the list goes on. 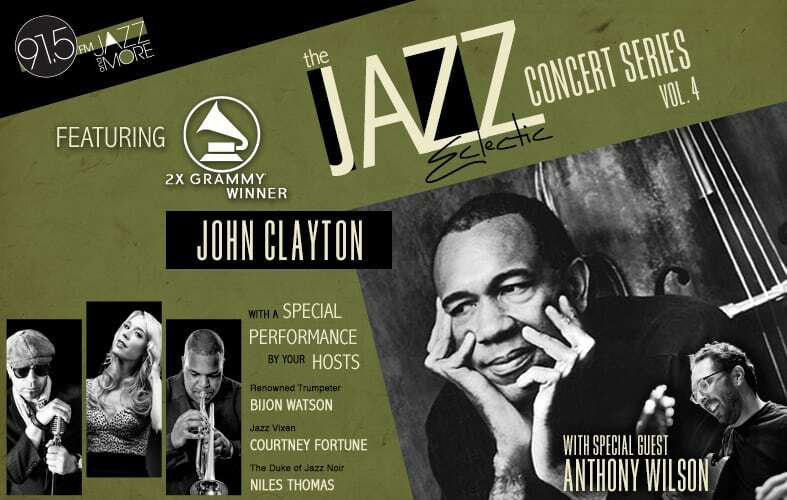 John is also the co-founder of the critically acclaimed and Grammy Nominated Clayton-Hamilton Jazz Orchestra. Also featuring GRAMMY NOMINEE, guitarist Anthony Wilson. Wilson has arranged and orchestrated for such notable artists as Barbra Streisand, Diana Krall, and can be heard on recordings by Paul McCartney, Willie Nelson, Leon Russell, Aaron Neville, Al Jarreau, to name a few. The Jazz Eclectic is a live jazz concert series co-founded and co-produced by world-renowned trumpeter Bijon Watson and “The Duke of Jazz Noir” Niles Thomas. As one of the coolest and most influential presenters of the new jazz age, attracting an enthusiastic newfound audience, The Jazz Eclectic is a live jazz concert series striving to increase the awareness and participation in diverse musical experiences worldwide. To this end, we present an eclectic blend of acclaimed artists including GRAMMY Winning and GRAMMY Nominees whose music and artistry embody The Art and Lifestyle of Jazz™. Bijon Watson is lead trumpet for the critically-acclaimed Clayton-Hamilton Jazz Orchestra, Grammy Nominee John Beasley’s Monkestra, and has been featured and recorded with many greats such as Michael Bublé, Diana Krall, the late Natalie Cole, Alicia Keys, Harry Connick Jr., Justin Timberlake… and the list goes on. Niles Thomas known as The Duke of Jazz Noir is an acclaimed singer/songwriter/composer previously signed under the EMI Music & Warner Bros Music umbrellas. As a music producer, Niles has been credited on many records, co-producing and writing for major artists in the mainstream market. Visit the official Jazz Eclectic website at www.jazzeclectic.com.